 Christ is God because He possesses all the attributes of deity. Jesus is man because He possesses all the attributes of humanity. Jesus Christ is the God-man, one person possessing two natures, both fully God and fully man at the same time. Christ existed prior to Creation (John 1:1, 14). Christ appeared in temporary human form, that is, as the Angel of the Lord, throughout the Old Testament (Genesis 16:7; Exodus 3:1-5; Luke 2:9; Acts 12:7). Christ claimed to have existed prior to Abraham (John 8:58). Christ is called the “Son of God” (John 10:33-36). Christ is fully God (Colossians 2:9; Hebrews 1:3). 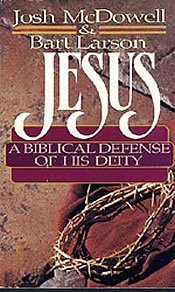 Jesus: A Biblical Defense of His Deity (from greatcom.org) Jesus Christ Is God; Jesus Christ Possesses the Names and Titles of God; Jesus Christ Possesses the Attributes of God; Jesus Christ Possesses the Authority of God; God Became Man in Jesus Christ; We Have the Witness of the Early Church; What Are Some Common Objections to the Deity of Christ? Is Jesus Christ Your Lord? How the Authors Discovered New Life in Jesus Christ.